A Taiwanese gaming site has posted cards detailing the movesets for characters Street Fighter X Tekken, due for release in March. 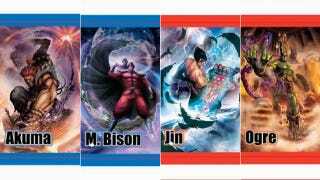 The big news here is that the movesets confirm M. Bison, Xiaoyu, Akuma, Jin and Ogre for the game's lineup. Bison and Xiaoyu were leaked out already, but not officially confirmed. Neither are any of these others, officially, but a listing of their movesets would seem to be good enough for most. All of the movesets are available at Shoryuken, below.